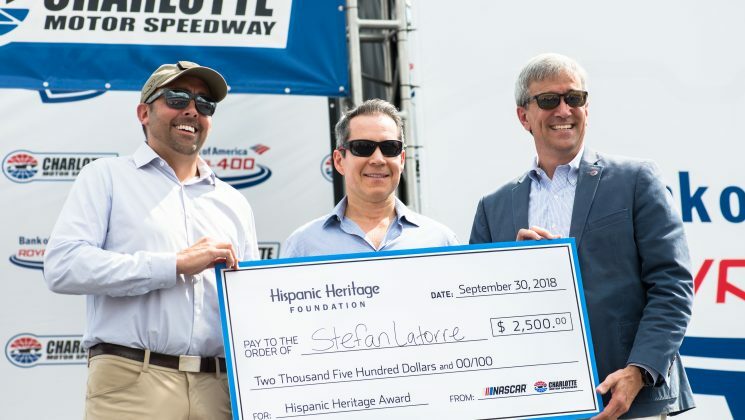 Charlotte, N.C. (Sept. 30, 2018) – NASCAR has partnered with Charlotte Motor Speedway and the Hispanic Heritage Foundation (HHF) to celebrate Hispanic Heritage Month (Sept. 15 – Oct. 15) and recognize the contributions of Stefan Latorre to the Hispanic community of Charlotte. Latorre was honored during the Bank of America ROVAL™ 400 on Sunday, Sept. 30, at Charlotte Motor Speedway. Latorre is the president of the Latorre Law Firm, which represents clients in personal injury, workers’ compensation, criminal defense, and immigration matters. As part of his commitment to the Hispanic community, Latorre provides free legal advice as the host of “La Verdad De La Ley” (The Truth of The Law), a Spanish-language radio program that is broadcast in 13 stations throughout the Carolinas and Florida. Latorre also organizes two charitable events annually – The Back to School event and the Fiesta Con Santa Christmas event – both of which have provided gifts and much needed supplies to thousands of children in the local community. Additionally, Latorre has served as the chairperson of the Charlotte Immigrant Integration Task Force, which evaluated and recommended ways to maximize immigrants’ economic and civic contributions to the city of Charlotte. Past Charlotte Motor Speedway award recipients include Norberto Sanchez, founder and CEO of Norsan Media and Pastor Rusty Price of Camino Church. Celebrating four years of partnership, HHF and NASCAR are proud to celebrate outstanding Latino leaders who are making an impact in their communities. Throughout Hispanic Heritage Month, three additional Hispanic leaders are honored across the country at Las Vegas Motor Speedway, Richmond Raceway and Dover International Speedway.